Hexaware Company Career Jobs Opening 2018-2019 Various Java/J2EE Developers Job Posts Download Application at www.hexaware.com. Hexaware Career Job has Recently Announced 2018 regarding Java/J2EE Developers & Various Job Openings Interested and Eligible Candidates can Download Application Through Official website. 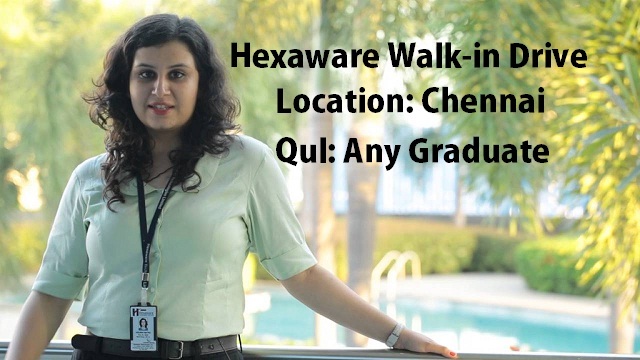 Hexaware Very Urgent Walk-in Drive @ Chennai - Apply Now. Candidate with Extensive Java, J2EE n-tier application experience. Ability to design/develop enterprise wide, large scale implementations. Extensive experience with SOAP/REST web service development Experience in Spring Core, Spring Boot. Strong knowledge and experience with NoSQL database technologies preferably with hands on experience in MongoDB. Skilled at writing specifications that other programmer can use to code data interfaces, user interfaces and workflows Familiar with tools such as GIT, SVN, JIRA, Jenkins and Maven Hands-on work experience working on development projects run using an Agile methodology, familiarity with DevOps practices. Navallur Post, Siruseri, Chennai - 603103."